RAD’s success is a direct result of partnering with premier companies. Our partners share our vision of building superior urban housing communities in the Los Angeles basin. They benefit from our ability to discover, acquire, entitle and zone properties. We benefit from their established infrastructures, enabling them to deliver financing, architects, contractors and marketing. The resulting transformation of underutilized real estate into attractive, functional residences benefits the partners and community. 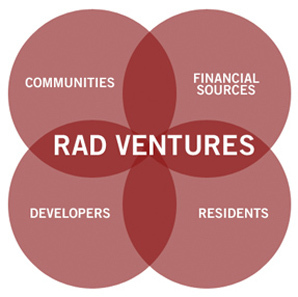 "Far East National Bank is proud to be RAD Ventures's business partner. This mutually beneficial relationship will contribute to the growth of both companies."